President Rivlin speaks at ceremony marking 65 years of Japan-Israel relations, notes cooperation on education, culture, aviation. 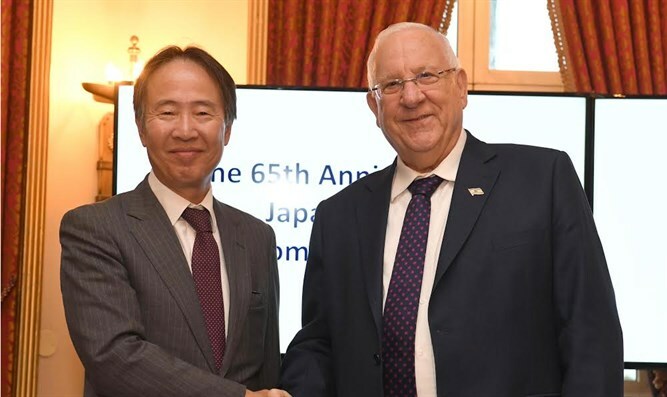 Israeli President Reuven Rivlin on Tuesday evening addressed a reception hosted at Jerusalem’s King David Hotel, by the Ambassador of Japan to Israel, H.E. Koji Tomita. The event celebrated 65 years of diplomatic relations between the two countries. “We also share a strong belief in our future but we don't take it for granted. That is why we invest so much in education. We know that a nation is only as good as its education. “I heard there is a Japanese art rooted in the fifteen century called Kintsugi, where you repair broken pottery with gloss mixed with gold. This art comes from the philosophy that looks at breakages as what makes the object even more beautiful and unique. “Both our nations have been horribly broken, more than once. We both built ourselves back, with brushes and gold, we carry our breakages with pride, they made us stronger, smarter, they made us beautiful. “For 65 years, Japan and Israel have cooperated in trade and science, culture and technology, education and aviation. We hold dear this cooperation, and we look forward to making it grow even stronger. “I am looking forward to working with all of you to make this bond even stronger in the decades to come”.